I absolutely LOVE MAC cosmetics. When I was a student, I was lucky enough to have MAC pro membership for a year (which I built majority of my kit up with) and now... I have it again. It's fantastic for being able to get discount on MAC or MAC pro products and master classes throughout the year. To be able to buy the MAC Zuca, you must be a MAC pro member. I paid £25 for my membership, which lasts a year. You can apply for this by going to the MAC pro website however you must be a makeup artist or in a profession of something similar. I rung the MAC pro enquires line (0800 054 2676) and paid £205 plus £2.95 postage for the Zuca. It was delivered within 3 working days by Yodal courier service. When I first opened it, it was smaller than what I thought it would be. However, that has not side tracked me and I would definitely still use it. 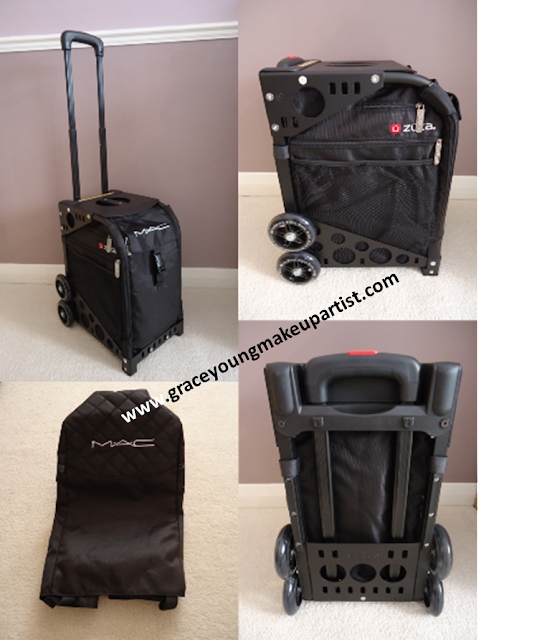 It is very sturdy, lightweight and easy to use/pull along. It has really good quality material and zip linings. Even the handle is great - you have to click down the red button on top of the handle to pull up/push down. It has a good level of security (the zip to the main compartment has a hole for a keypad lock and a clip to secure the flap which covers the main compartment zip). The seat is comfortable too (for you or your model). I think you can buy padded cushion covers for them - which I may do for extra comfort. There are several compartments and straps throughout the bag which you could use to store clips/grips onto. Good for all those who organise their kit thoroughly! There is meshing on the inside of the bag (on the top - which would be great to store a brush belt etc) and at both sides. It comes with a protective quilted liner which slots over the top of the Zuca when travelling or when its not in use. On the covering, it has a zip in a semi circle shape which can be undone to pull the handle through when pulling along. 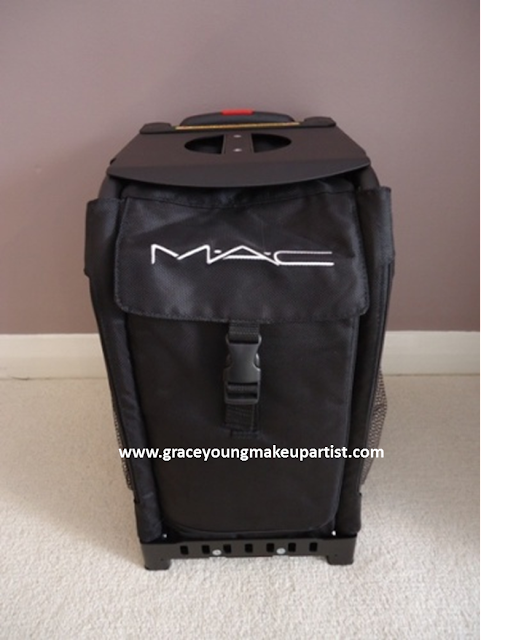 It is SO much easier to use the MAC Zuca than to cart around large bags. 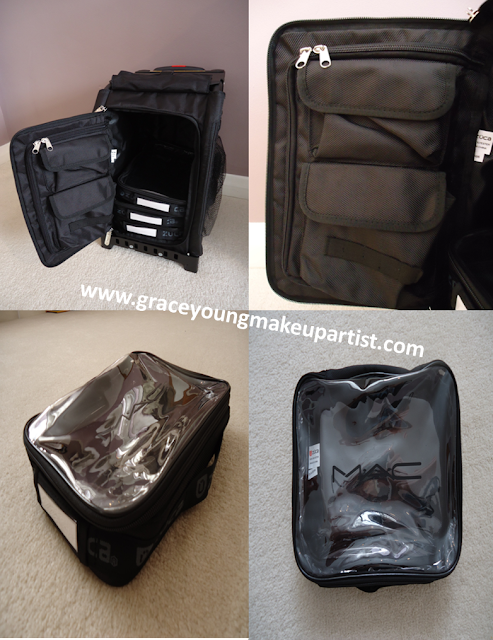 I was never a fan of beauty trolleys or makeup boxes however, this looks professional and was worth every penny! 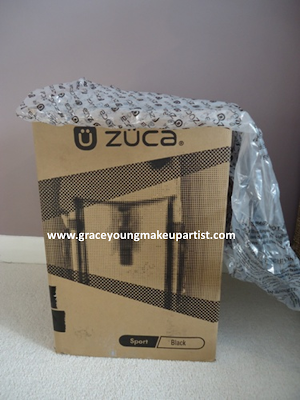 I will be doing another post on how I pack my Zuca for makeups very soon, so watch this space guys! i want a amc zuca so bad!